Mix egg, egg yolks, and sugar together in large bowl. In a seperate double boiler heat cream, but do not boil. Slowly add the heated cream to the egg mixture. Add the vanilla extract and Grand Marnier to the mixture. Combine well, and divide among 5-6 ramekins. Place the ramekins in a baking pan and carefully pour boiling water into pan until it comes halfway up the side of the ramekins. Bake at 300F for about 35 to 40 minutes, or until custards are set. Remove custards and let cool to room temp and refrigerate for at least 4 hours. 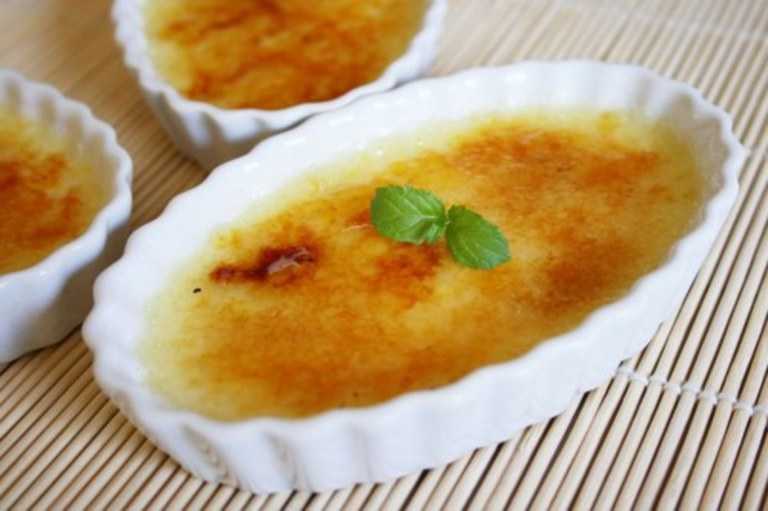 To serve, spread about 1 tablespoon sugar evenly on top of custard and heat with a kitchen blowtorch until sugar caramelize and harden.